ELMWOOD PARK, NJ, April 17, 2019 (GLOBE NEWSWIRE) — BioReference Laboratories, Inc., an OPKO Health Company (NYSE:OPK), is pleased to announce it has been recognized by Forbes as one of America’s Best Large Employers of 2019. This list includes 500 large companies, and BioReference is one of only 15 companies in the Health Care Equipment and Services category to be selected for this designation. BioReference provides comprehensive laboratory testing to physicians, clinics, hospitals, employers, government entities, correctional institutions and medical groups. In addition to routine laboratory testing, BioReference provides specialty testing in the areas of genetics, women’s health, maternal-fetal medicine, oncology and urology. “We take great pride in the exceptional people who stand behind our services and allow us to provide patients and providers best-in-class diagnostic testing and operational excellence. We are very excited that our community of employees has anonymously selected our organization to be recognized by Forbes as one of the Best Large Employers of 2019,” said Geoff Monk, President of BioReference Laboratories. BioReference is a preferred choice for clinical laboratory personnel, offering excellent benefits, growth opportunities and flexible work schedules. The laboratory’s diverse talent areas range from billing, customer service, information technology, phlebotomy, sales and marketing to quality assurance, processing, logistics, supply management, pathology, cytology, coagulation and genetics. “From the phlebotomist serving the patient to the pathologist behind the microscope, all employees are a vital part of the team inspiring the future of healthcare at BioReference. 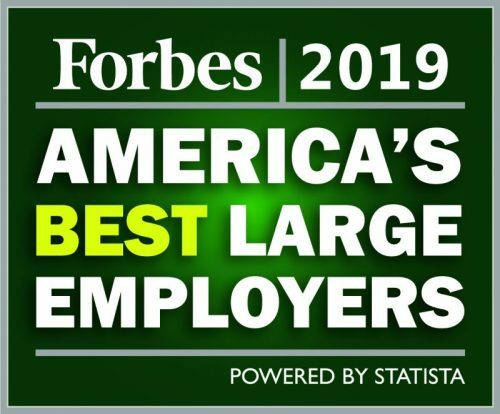 Having been named one of the Best Large Employers of 2019 confirms that it’s an exciting time to join our dynamic organization as we seek to establish industry-leading positions in large, rapidly growing markets,” said Greg Cahill, Vice President, Human Resources, BioReference Laboratories. America’s Best Employers were selected based on an independent survey by Forbes and Statista, where over 50,000 employees in 25 different industries working for companies with at least 1,000 people employed in their U.S. locations were asked open-ended questions regarding his/her own employer. The evaluation was based on both Direct and Indirect Recommendations. For more information about BioReference Laboratories and the company’s comprehensive test offerings, go to www.bioreference.com, and for more information about how to join the laboratory’s dynamic team of dedicated employees, please visit https://www.bioreference.com/about/careers/. BioReference provides comprehensive testing to physicians, clinics, hospitals, employers, government units, correctional institutions and medical groups. The company is in network with the five largest health plans in the United States, operates a network of 11 laboratory locations, and is backed by a medical staff of more than 160 MD, PhD and other professional level clinicians and scientists. With a leading position in the areas of genetics, women’s health, maternal-fetal medicine, oncology and urology, BioReference and its specialty laboratories, GenPath and GeneDx, are advancing the course of modern medicine. For more information, visit www.bioreference.com. OPKO Health is a diversified healthcare company. In diagnostics, its BioReference Laboratories is the nation’s third largest clinical laboratory; GeneDx is a rapidly growing genetic testing business; the 4Kscore® prostate cancer test is used to confirm an elevated PSA to help decide about next steps such as prostate biopsy; Claros® 1 is a point-of-care diagnostics platform with a total PSA test approved by the FDA and testosterone as the most advanced test in development. In our pharmaceutical pipeline, RAYALDEE is our first pharmaceutical product to be marketed. OPK88003, a once-weekly oxyntomodulin for type 2 diabetes and obesity recently reported positive data from a Phase 2 clinical trial. It’s among a new class of GLP-1/glucagon receptor dual agonists. OPK88004, a SARM (selective androgen receptor modulator) is currently being studied for various potential indications. The Company’s most advanced product utilizing its CTP technology, a once-weekly human growth hormone for injection, is in Phase 3 trials, and is partnered with Pfizer. OPKO also has research, development, production and distribution facilities abroad. More information is available at www.opko.com. This press release contains “forward-looking statements,” as that term is defined under the Private Securities Litigation Reform Act of 1995 (PSLRA), which statements may be identified by words such as “expects,” “plans,” “projects,” “will,” “may,” “anticipates,” “believes,” “should,” “intends,” “estimates,” and other words of similar meaning, including statements about expectations for BioReference and GeneDx, and our ability to launch new tests, the ability to deliver laboratory results that will lead to the best clinical outcomes, ability to deliver timely, accurate and quality laboratory results, as well as other non-historical statements about our expectations, beliefs or intentions. Many factors could cause our actual activities or results to differ materially from the activities and results anticipated in forward-looking statements. These factors include those described in the OPKO Health, Inc. Annual Reports on Form 10-K filed and to be filed with the Securities and Exchange Commission and in our other filings with the Securities and Exchange Commission. Forward-looking statements may also be adversely affected by general market factors, competitive product development, product availability, federal and state regulations and legislation, the regulatory process for new products and indications, manufacturing issues that may arise, patent positions and litigation, among other factors. The forward-looking statements contained in this press release speak only as of the date the statements were made, and we do not undertake any obligation to update forward-looking statements. We intend that all forward-looking statements be subject to the safe-harbor provisions of the PSLRA.